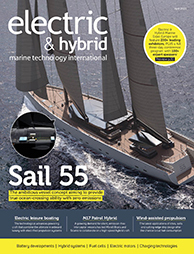 Over 4,500 attendees descended on Electric & Hybrid Marine World Expo in Amsterdam from 27-29 June 2018 to see the latest innovations from more than 130 exhibitors, as well as learn from some 50 conference papers presented by some of the industry’s leading lights. The show, which welcomed more attendees, delegates and exhibits than ever before, has established itself as the world’s largest dedicated marine propulsion exhibition and conference; and visitors to the fifth edition of the event were treated to a wide range of exciting new product launches and key announcements throughout all three days. Torqeedo’s range of electric and hybrid drives from 0.5-100kW for commercial applications and recreational use generated strong interest, after the company announced live at the show that the range would be part of an integrated electric propulsion system for a new aluminium solar-electric passenger ferry due to enter service on Spain’s Mediterranean coast later this summer. Elsewhere on the show floor, Japanese engine manufacturer Yanmar unveiled a working prototype of its new marine generator set, which is designed as a total electrical power and propulsion solution for workboats, small ferries and other vessels measuring up to approximately 24m (79ft) length. More news came from Lithium Werks, a provider of lithium iron phosphate cells, modules and scalable power systems, as the company shared details of its multi-year agreement with Dutch lithium battery manufacturer Super B. On The Switch’s stand, the advanced drivetrain manufacturer announced that its parent company, Yaskawa Corporation, is making a multimillion-dollar investment in The Switch’s R&D capabilities and purchasing new equipment for its factory in Lappeenranta, Finland. Meanwhile, Canadian energy storage system manufacturer Corvus Energy, which used Electric & Hybrid Marine World Expo to showcase its latest-generation Orca Energy ESS, revealed that the product will be used to power shore stations in Brekstad and Valser in Norway for a fleet of new hybrid-electric ferries operated by Fjord1. The second day of the show saw ABB announce a memorandum of understanding with Ballard Power Systems to jointly design, develop and validate a next-generation zero-emission fuel-cell powerplant for the shipping industry. Another big news story came from Italian power transmission manufacturer Transfluid, which announced it has acquired 100% of the shares in IDTechnology, owner of the Bellmarine brand, a Dutch electric propulsion system developer for commercial boating applications. Meanwhile, Xalt Energy, the US lithium-ion cell and battery systems manufacturer, not only debuted its new XRS XPAND battery rack system, but also announced that the XPAND battery system the rack is designed for has been certified as acceptable for installation on all marine vessels classified by DNV GL. Visitors were also able to discover more about the XRS XPAND battery rack system, which incorporates XPAND battery packs and battery management systems in modular, expandable racks. A typical rack contains two strings of 10 series-connected packs, with an operating voltage up to 1,000V and total energy up to 222kWh. More news came from BMA Technology, following its signing of a contract to deliver and integrate systems for the world’s first completely battery-powered tugboat. As a partner in the project, BMA is responsible for designing, engineering, project managing and commissioning the complete power and propulsion systems. Designed and built by fellow exhibitor Navtek Naval Technologies, the NV-712 ZeeTUG (which stands for Zero Emissions Electrical Tug) will be powered by two 712kWh lithium-ion battery systems and two 968kWe electric propulsion motors. It will feature power drives, an energy management system, integrated alarm monitoring and control system, and onboard electrical installation. Visitors to the 2018 Electric & Hybrid Marine World Expo were able to experience what the zero-emission tug’s deck, engine and battery rooms will look like via a virtual-reality headset at Navtek’s stand. Elsewhere on the show floor, lithium-ion battery system provider Forsee Power showcased its newly expanded product range, with its fully integrated Zen 35 and Pulse 15 battery packs taking centre stage. Such is the increasing clamour among shipowners and operators to ensure their vessels meet forthcoming stringent regulations – such as the International Maritime Organization’s goal of slashing emissions output by 50% by 2050, and the Norwegian Government’s announcement that its historical fjords will be serviced only by all-electric vessels by 2026 – that attendees were also unanimous in their praise of the diversity of products on display at Electric & Hybrid Marine World Expo. Exhibitors were also extremely happy with the number and quality of visitors in attendance. “The profile of people here – mainly engineers and corporate management – means we’ve benefited from opportunities we typically would not have been able to find through conventional channels,” said Michael Ruscigno, co-founder, Baknor Electronics Industries. The dates for the 2019 show are 25-27 June. Exhibition entrance is free, but a conference fee exists. Early booking is recommended to guarantee yourself a seat at the conference. Space is strictly limited and seats are awarded on a first-come, first-served basis. To book your conference place, click here. You can register for your free 2019 exhibition pass here.